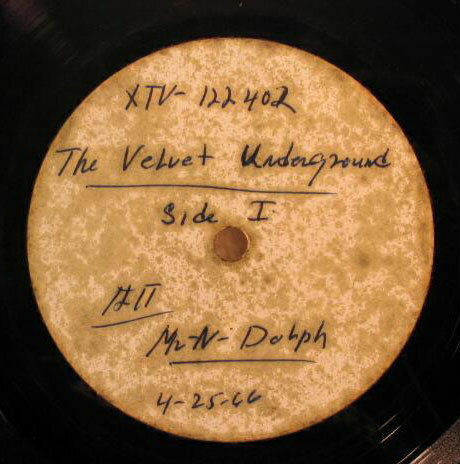 From The Velvet Underground’s 1st studio session, recorded over 4 days in April 1966. This acetate copy of the final mixes originally belonged to studio owner Norman Dolph, and was famously found at a yard sale for 75 cents and then sold for over $25,000. Several different versions have appeared in various dark corners of the internet over the past few years; this one, from the bootleg CD “Unripened”, sounds best IMO. Perhaps “least awful” is a more accurate description of the recording’s sound quality, but this is still an amazing artifact. What you’re holding in your hand is what the first Velvet Underground album would have sounded like had it not been rejected by the powers that be. Andy Warhol’s intention was to capitalize on the buzz surrounding the band’s debut gigs under the guise of the Exploding Plastic Inevitable shows. A music-art-freak out-happening. Andy, wanting to keep the band’s abrasive sound and seedy subject matter, arranged for a session at a run down New York studio called Scepter Studios, under the watchful eye of a Mr. Norman Dolph. Payment for the four day recording session in April 1966 was one of Andy’s paintings. Which in time would prove very financially rewarding for Mr. Dolph. user friendly feel to the album. Here we present the original album taken from the acetate version with its original running order. “European Son” opens the album, which is a completely different take than the released version. It has a blusier structure that builds more gradually and is several minutes longer. “The Black Angel’s Death Song” is a different mix to the finished tune. “All Tomorrow’s Parties” again is a different mix to the released version. “I’ll Be Your Mirror” has a radically different sound that has less echo on Nico’s vocals and the backing vocals are lower in the mix. “Heroin” is a completely different version. The guitar line is different, vocal infections are different and contain some different lyrics. The drumming is more primitive and runs parallel with a tambourine. “Femme Fatale” is also a radically different mix. The percussion is more prominent and the background vocals used in a poppier way. “Venus In Furs” is a completely different version. The vocal accents are different. Instrumentation more based around John Cale’s viola than the guitar, as in the released version. “I’m waiting For The Man” is a completely different version. The guitar line is completely different and some of the lyrics also. No drums, just tambourine and a bluesy guitar solo. “Run Run Run” is a different mix to the released version. What also changes the feel of the album is the running order. This original version starting with “European son” and with the absence of the lighter cut “Sunday Morning” that opened the released version, gives the album a darker feel. Which one is better? That is up to you to decide. But now for the first time since 1966 you can hear the dreamscape that the band and Mr. Andy Warhol had in store for us. So sit back, peel slowly and listen to this lost masterpiece in all its unripened glory. Taken from original acetate version. Every effort has been made to clean up the sound, but also keep the feel.